In the fourth grade, Russ Linton wrote down the vague goal of becoming a “writer and an artist” when he grew up. After a journey that led him from philosopher to graphic designer to stay-at-home parent and even a stint as an Investigative Specialist with the FBI, he finally got around to that “writing” part which he now pursues full time. 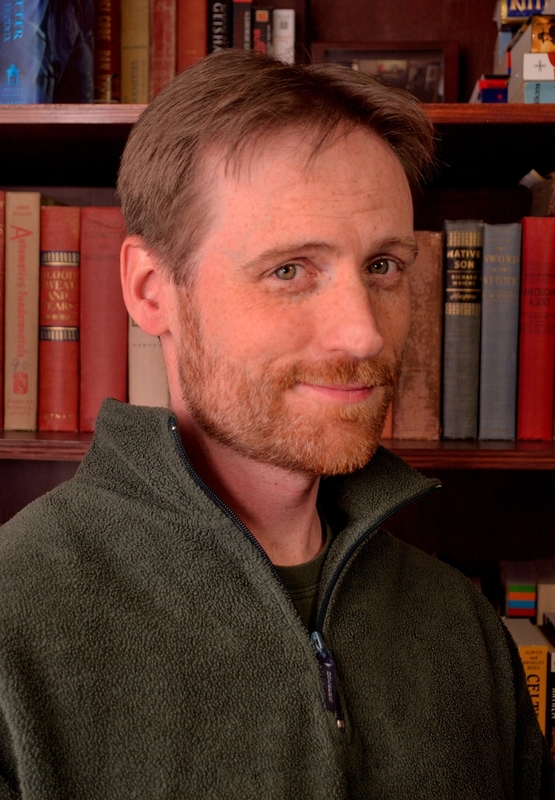 Russ creates character-driven speculative fiction. His stories drip with magic, blood, sarcasm, and radioactive spiders. He writes for adults who are young at heart and youngsters who are old souls. He has published numerous articles and seven short stories to date and will be publishing his debut novel, Crimson Son in June 2014. 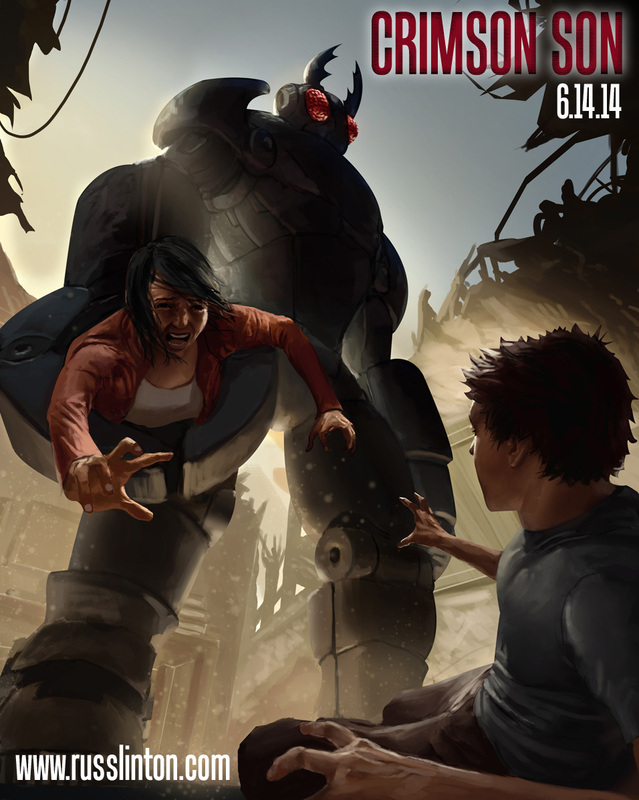 June 14, 2014 – Crimson Son Released! Critics agree, Crimson Son is a 5 star novel that redefines the superhero genre! Own a copy of this critically acclaimed novel today! Nineteen-year-old Spencer is the son of the Crimson Mask, the world’s most powerful Augment. Since witnessing his mother’s abduction by a psychotic super villain two years ago, he’s been confined to his father’s arctic bunker. 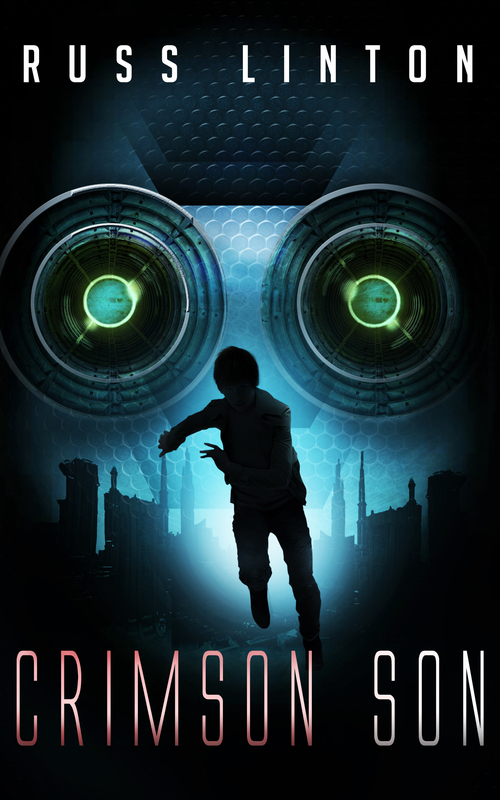 When the “Icehole” comes under attack from a rampaging robot, Spencer launches into his father’s dangerous world of weaponized human beings known as Augments. With no superpowers of his own save a multi-tool, a quick wit and a boatload of emotional trauma, Spencer seeks to uncover his mother’s fate and confront his absentee superhero father. As he stumbles through a web of conspiracies and top secret facilities, he rallies a team of everyday people and cast-off Augments. But Spencer soon discovers that the Black Beetle isn’t his only enemy, nor his worst. Heart pounding action mixed with an emotional coming of age tale narrated by a “kid” with enough snark to claim it as his own superpower, Crimson Son delivers on all fronts. Crimson Son is a strong, rite-of-passage piece, examining the bonds of father and son and the impact each can have on the other, set against the worlds of augmented super-beings and shadowy government conspiracies. It shouldn’t work as well as it does, but it does. In spades. I’m an explorer by nature so I’ve discovered the ebooks I own through nearly every way imaginable. A few are written by colleagues, some I sought out after meeting the authors, many have been recommended by fellow readers and some I discovered surfing Amazon or even found on the author’s website. Our library loans eBooks as well. Well, I’m sure I wrote something prior to this, but the one that comes to mind is a book I wrote for my fourth grade English class, The Demons of Avalon. It was essentially an homage to Harrison Ford. A reluctant space pirate (Han Solo) gets drafted into helping save the universe from an out of control bad guy with a dangerous space artifact. In the end, the bad guy’s head explodes when the artifact power is released (ala Raiders of the Lost Ark.) It was pretty terrible, but, for 4th grade, it earned one of the few A’s of my elementary school career. I’m a pantser, which means minimal to no plotting. Often, I start with a vivid scene and start typing and see what happens. I usually have a general overview of the world and a broad idea of the direction I want to see the plot head, but the details all get hammered out on the fly. Often, this leads to interesting discoveries and sometimes I rethink the entire direction. It’s very liberating. I manage to pull this off almost entirely thanks to a gaming career that predates my professional writing by a few decades. I was always the guy selected to be the gamemaster because I could cobble together a cohesive plot line on the fly while reacting to player decisions. Writing is in many ways easier because I’m the only one with input into the story! First ever is going pretty far back. Like most writers, I was an early bloomer when it came to reading skills. My mom really encouraged this because as a child she made reading to myself and my twin sister along with trips to the library a priority. We repaid her by telling her to stop reading to us so we could devour books faster. I recall many of those early readers, from Seuss to the poetry of Silverstein. But the first chapter book I ever read that left a lasting impression was Lewis’ The Magician’s Nephew. I was so entranced by Lewis’ style, imagery and even the British spelling of things, it sunk deep into my subconscious. I didn’t realize how deeply that story affected me until I launched this full time writing journey and sat down to re-read that book. I’m not an overly emotional person, but I got a bit misty-eyed when I read the description of the Wood Between the Worlds after so many years. When the children surface and you realize that they came from a single pool and the wood is filled with more and more pools and the possibilities are endless. He created a place where every writer stops before picking a pool and jumping in head first. Of course, then you read Lev Grossman’s Magicians and you cry for the portal world in an entirely different way. The Good Earth – because the imagery is beautiful and it is a classic example of writing the “other”; Buck’s investment in the culture she witnessed was evident on every page. The Magician’s Nephew – because Lewis not only unlocked Narnia but a whole universe of imagination in that Wood. Dragonlance – Dragons of Winter Night – because I’ve never worn a cover of a book so thin. Yellowed, exhausted, it finally gave way under my own sons hands, but that was only fitting. Over Nine Waves – This is a translation of some of the oldest stories in European tradition – Irish legends to be precise. The stories are timeless and the foundations of every western fantasy tale you have ever read are evident in each tale. Every writer needs to find their center in tradition and myth whether they ascribe to any particular culture themselves or not. The fifth? The book I have yet to pick up, written by a starry eyed (and hopelessly naive) writer that will again transform me in some undeniable way and continue to inspire me to commit my own insanity to the page. I’ll read anything though it has to have depth. Fiction, non-fiction, I can’t easily say what draws me to a book, but a bit of fantasy in my fiction is always necessary. My recent reading list includes, A Once Crowded Sky, The Road, The Ocean at the End of the Lane, The Golem and the Jinni, and I habitually read The Economist because understanding the world lends to creating believable new ones. That and they have the best covers of any news magazine along with that dry English wit. I’ve been told my desk is organized, but I don’t see it. Superman pez dispenser (I’m a Marvel guy though, really) next to a miniature pewter skull. All that training and I walked away from the FBI with a commemorative coffee mug. There’s a mesh container of colored paper clips for my crit nights (which people have been slowly stealing to either make their own collections or form a horrific multicolored golem designed to entrap works-in-progress), my laptop, my monitor, my funky new keyboard. Oh, almost forgot, the immortal stack of crap I really need to go through. That and post-its. Lots of colored post-its. Time and money. While I was sending out queries and collecting rejections I was also trying to sell short stories. I had one year where every story I had out was simply circulating through slush piles, often getting very close to publication but after months of wait time being turned down. I’ve been self employed for the past six years, so the thought of how much money I might have made while sitting around waiting for someone to pull the trigger was too much to ignore. Everything. Seriously. Right now, I have only a few and we share either blood or living space. But every single person that discovers my work and shares it with others will mean everything to me. A fantasy novel. It’s epic fantasy, but not really, and like Crimson Son, focuses on the unlikely heroes at the center of a maelstrom.